Rae | Pump That Pedal - We've got it, You want it, Come and get it. Out for a cruise in the old bus wearing some jeans, a tshirt and blue Converse sneakers with white laces and polka dots. This is a ‘normal’ drive because this was when we were trying to get some miles on the new motor. She’s gets pretty annoyed with the old Monte when it doesn’t want to start or stay running. The first few minutes are her struggling to get the car started. She’s had some old car experience and tries not to flood it out but that Chevy is a turd sometimes! When…. She stretches the legs of this little car with a tshirt, jeans and her bare feet. She takes it on a curvy road and has some fun. 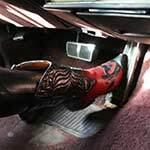 The skinny pedal can only fit a toe or two when pressing it down to go. We stop for gas and as we’re…. She’s cruising around these backroads in the loud Camaro on a nice day. She’s wearing a pair of flat thong sandals. She pops the transmission into neutral at times to rev it while coasting. Yeah, the little car didn’t give her that much time to get it started. She’s wearing black leather pants, a denim jacket and wooden sandals with a red leather strap. She takes the Bus on a cruise to put some miles on that new motor. She’s a pretty good stick shift driver and takes to the Bus with relative ease. Not driving it too hard but taking it’s through the paces so that one day, very soon, she can lay…. She gets the crash course before we start filming and then I turn her loose. There’s a lot of pedal work when driving this bus around these back roads. These shiny blue strap wedges show off her toes and heel perfectly! The old, tired 368 engine in the Caddy takes a bit to get going in the beginning. Rae is no stranger to cranking crappy cars, so she knows just what to do but that doesn’t mean it’ll start any quicker. An old and worn out carb on an old, tired…. Some cranking, some smoking and some driving in the 1980 Cadillac Coupe Deville with Rae (formerly known as Gigi). She’s got some tight jeans on paired with some classic cowgirl boots in black. You might need to turn the brightness up a bit to see the boots better. Rae is a little on the chilly side, so she decides to grab her jacket from the trunk of her car. Since it is pretty cool outside, she revs her Cavalier to warm the engine before she continues on her way.